Popular conceptions of Vikings often portray them as savage raiders that pillaged their way across Northern Europe during the Dark Ages. Such concepts are much more the product of modern myth and legend and hide the true complexity and ingenuity of these seafaring peoples . The Vikings came from what is now Norway, Sweden, and Denmark, having their origins in small agricultural Chiefdoms . They had developed shallow-draft boats that were capable of navigating inland seaways and rivers. These would later become the iconic Viking ships of legend. What drove these people to expand out of Scandinavia to raid and colonise new territories is not known, but it likely was a consequence of over-population and poor agriculture productivity in their native lands . Starting with raids in Lindisfarne England in 793 AD, the Vikings expanded both east and west, reaching far into present-day Russia. They even made forays into the Mediterranean and the Islamic world. 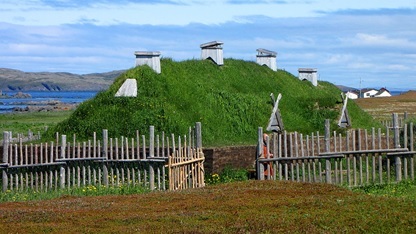 They were the first known European colonists in the Americas, starting a short-lived colony in Vinland, which is now in the Canadian province of Newfoundland . They also set up colonies in both Greenland and Iceland. They formed a kingdom within the British Isles known as the Danelaw, which encompassed lands that took up much of present-day northern and eastern England . They established control over feudal northern French territories now known and Normandy . The Norman invasion of England in 1066 is often seen as the end of the Viking Age in Western Europe, although the Norse origins of the Normans could be regarded as one of the lasting legacies of this period into modern times. The Vikings have often been described as pagans or heathens in history. Their original Old Norse religion was an amalgamation of different ancient Germanic traditions, and is the origin of gods such as Odin and Thor, which figure in popular mythology even in the Christian world today . The Vikings eventually all converted to Christianity, often for the purposes of trade and political allegiances. It is thought that the Iceland had been uninhabited prior to the arrival of the Vikings, although there were written accounts from the time of Irish monks known as Papars have lived on the Island prior to Norse arrival. Historical accounts suggest Irish religious migrants around the year 800 had lived on such an island . The finding of beads and some cross markings appears to confirm this , although archaeological evidence is limited. Iceland may have been uninhabited by the time the Vikings arrived. It is generally believed that the earliest Norse encounter with the island occurred when Naddodd and Garðar accidentally sailed there when blown off course when heading to Norway. Hrafna-Flóki was the first Norse explorer that intentionally sailed to Iceland and brought back tales of the island’s potential wealth . Starting around 870 AD, migration to Iceland began. These people mainly came from Norway, although there is written evidence that some of the settlers were British, with many coming from Scotland [11-12]. These settlers were encouraged by the limited farmland in Norway, and geologic records have shown that the weather of the North Atlantic may have been milder around the time of the Viking settlement of Iceland, Greenland, and North America . This would have made these regions more appealing perhaps than they are today as farmland. During early Icelandic history the island’s communities had been governed by independent chieftans. In 930 AD these chieftans agreed to form a governing body called the Althing which is one of the world’s oldest existing parliaments and is still active today . While the Viking age of exploration and expansion came to an end in the 11th century, Iceland remained inhabited throughout the subsequent centuries. 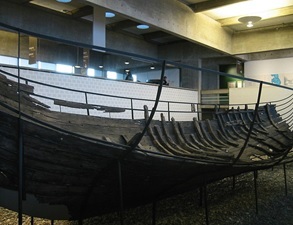 They are today still inhabited by the descendants of these early Viking settlers. Recent research looking at the ancient DNA of Iceland Vikings from multiple archaeological sites dating to the late first millennium has shown that they had predominantly Norse but also Gaelic origins . These results confirm the historical records of migration from both Scandinavia and the British Isles. Over time, changes in the frequencies of certain genes have meant that Iceland has developed a distinct genetic signature into modern times, likely as an effect of being an island. The mitochondrial haplogroups of ancient Icelanders is dominated by H K, and J lineages. H and K are common in Europe today and are thought to have arrived in Europe with the appearance of agriculture some 9,000 years ago, having Middle Eastern origins [16-17]. The mitochondrial J haplogroup is also common in Europe today and is though to be of Caucuses origins, having moved into Europe with horse-riding nomads at the start of the Bronze Age . The vast majority of ancient Icelandic males belonged to the Y chromosome haplogroups R1b or R1a, while a few belonged to haplogroup I. All of these Y chromosome lineages are common among Europeans today and are associated with the spread of Caucuses peoples during the Bronze Age [19-22]. Couplan S. 2003. The Vikings on the Continent in Myth and History. History 88: 186-203. Barrett JH. 2008. What caused the Viking Age? Antiquity 82: 671-685. Barrett JH. 2010. Rounding up the Usual Suspects: Causation and the Viking Age Diaspora. The Global Origins and Development of Seafaring. McDonald Institute for Archaeological Research: Cambridge. Wallace B. 2003. “The Norse in Newfoundland: L’Anse aux Meadows and Vinland,” Newfoundland Studies 19, no. 1 pp. 5–43. Fellows-Jensen G. 1984. Viking settlement in the Northern and Western Isles—the place name evidence as seen from Denmark and the Danelaw. In (A. Fenton & H. Pa´lsson, Eds) The Northern and Western Isles in the Viking World. Edinburgh: pp. 146–168. Loyn H. 1991. Anglo-Saxon England and the Norman Conquest 2nd ed. Longman: London. Hultgard A. 2008. The religion of the Vikings, in ˚ The Viking World, eds. S. Brink & N. Price. Routledge: London. pp. 212–218. Lindow J. 1997. "Íslendingabók" and Myth. Scandinavian Studies 69:454-463. Sveinbjarnardóttir G. 2002. The question of papar in Iceland. In: Crawford BE, (ed.) (Proceedings) The papar in the North Atlantic: Environment and History. pp. pp. 97-106. Wernick R. 1979. The Vikings. Time Life Books: Alexandria. Thompson EA. 1979. 1973. The Icelandic admixture problem. Annals of Human Genetics 37, 69-80. Loyn, H. 1977. The Vikings in Britain. St Martin’s Press: New York. Williams JT. 1993. Origin and population structure of the Icelanders. Human Biology 65: 167-191. Sunna Ebenesersdóttir S. 2018. Ancient genomes from Iceland reveal the making of a human population. Science 360: 1028-1032.